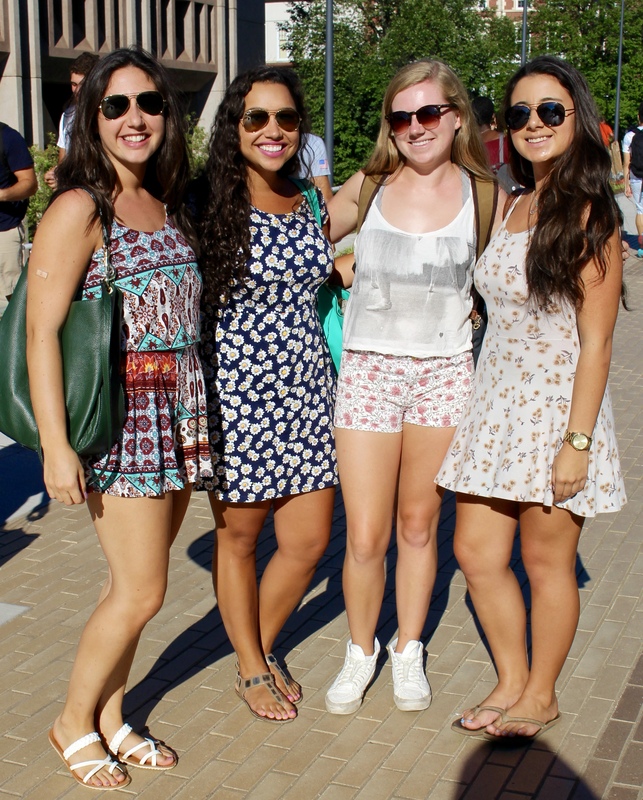 This year, the first day of classes at Syracuse University was bright, sunny and warm. Based on what students were strutting Monday, it is likely fun prints will be seen on campus for the remainder of the season. Geometric and tribal patterns showed up in clothing ranging from tanks and rompers to bowties. Many female students wore skirts, shorts and dresses due to the high temperatures. Shades of solid blue showed up on guys and ladies. Another notable trend for all students was comfortable footwear: sneakers, sandals and slip-ons. And almost everyone was rocking a pair of stylish shades. Check out the slideshow to see some of these trends and get a glimpse at what students were showing off for their first day of classes.